I was in a cauliflower rut. I’d steamed it and tossed it with raisins and capers. I’d steamed it and mashed it with garlic and oil. I’d roasted it in a pool of extra virgin olive oil and topped it with kalamata olives. Now what? Sometimes, a different format is the solution: move out of the side dish realm and into another course. I decided to make soup and see what would happen if I roasted the cauliflower, along with roasting onions and garlic. The result was a rich, buttery soup with a nutty taste. And, like most soups, the flavor intensifies and tastes even better the next day. But once I blended it, the soup was beige-brown. A nice color for baked cookies, but not soup. I could either serve it by candlelight (but you guys would know) or garnish it to add color and another flavor note. So, I made some curried parsley oil to drizzle on top along with a scatter of some avocado cubes. You could skip the drizzle and sprinkle the soup with some chopped parsley for garnish. As for serving ideas, keep in mind that the soup is very filling. It would make a great lunch, along with fruit, or a hearty dinner when paired with a salad and grainy bread. Preheat oven to 375 F degrees. Peel onion and slice into ¼-inch thick slices. Put onto rimmed baking sheet and toss with 1 tsp olive oil. On same baking sheet, add garlic with skin on, and toss with 1 tsp olive oil. Sprinkle onions and garlic with salt. On second rimmed baking sheet, toss cauliflower with remaining 1 TBS olive oil, sprinkle with salt, and put both pans in the oven. 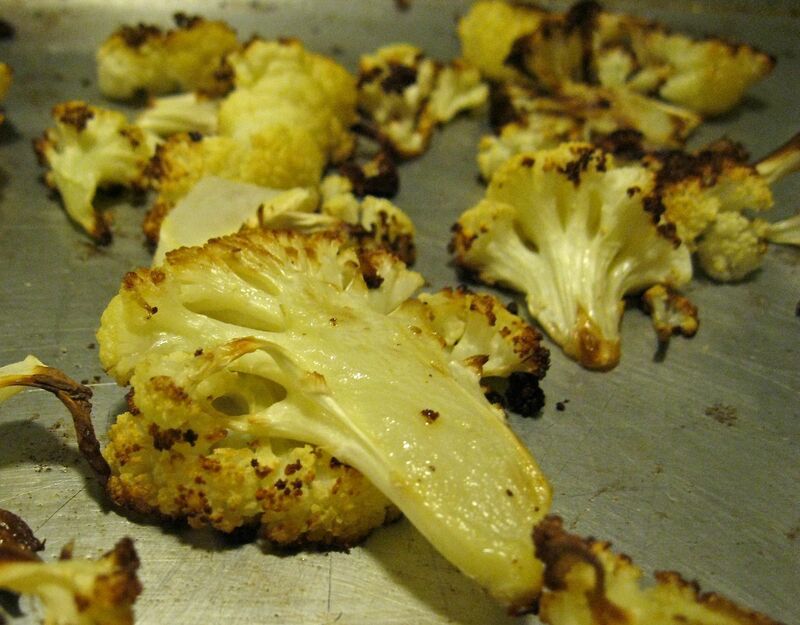 After 10 minutes, turn over the onion slices with a spatula and toss the cauliflower. Continue roasting another 10 minutes or more, until onions and cauliflower are lightly browned with some crispy edges. Remove pans from the oven to cool. While the vegetables are roasting, make the curried parsley oil: Heat the oil in a small pan over medium high heat. Add the almonds and cook, watching closely until the almonds are lightly browned, about 2-5 minutes. Stir in the curry powder and crushed red chile pepper and remove from the heat. Let cool for a few minutes and then put in a blender or food processor. Add the salt and parsley, and process or mix until well blended. 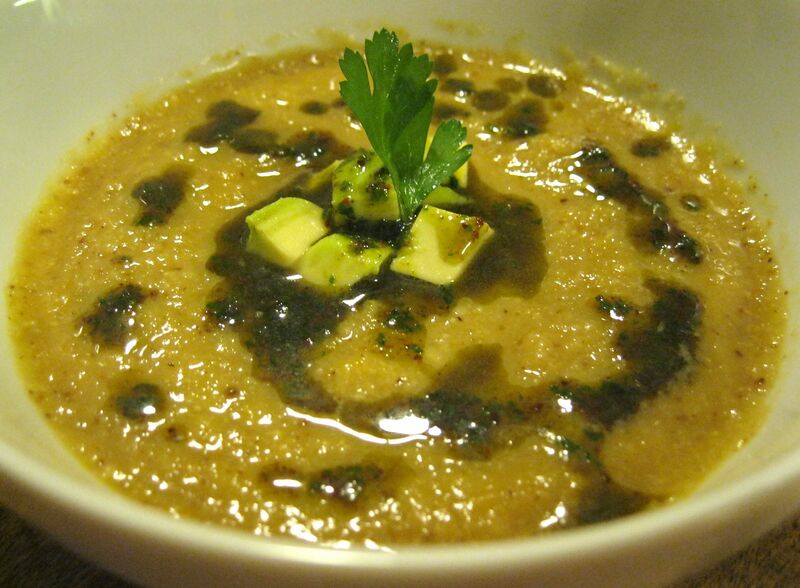 Serve the soup in bowls, topping with a drizzle of the curried parsley oil and chopped avocado and parsley, if using. This entry was posted in Comfort food, Healthy, Soup, vegan, vegetables, vegetarian and tagged cauliflower, easy low-fat soup, vegan soup by Amy. Bookmark the permalink.